There, I met Zuldee, a Sabahan guy on a weekend vacation here in the Philippines, visiting his Filipina girlfriend Ning (if my memory is correct). I smiled at him and asked, in English, if he’s going to Kota Kinabalu. He just smiled and nodded. 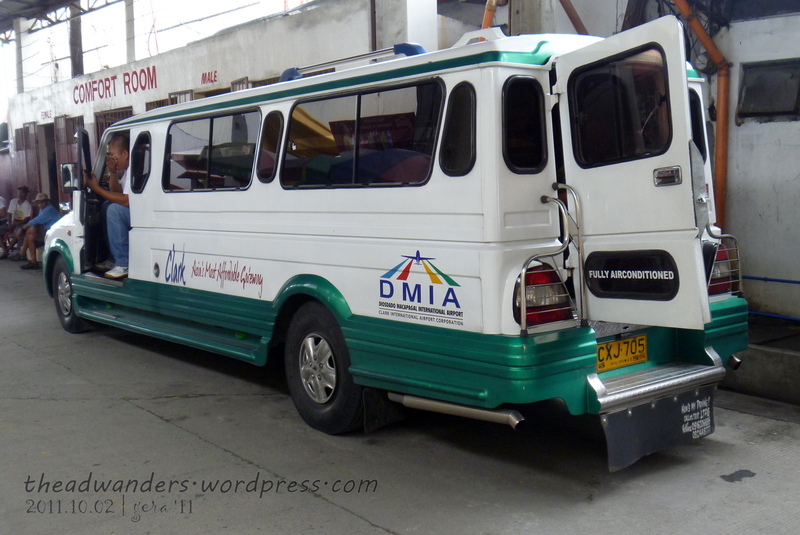 After some time, Ning stood from where she was smoking and climbed back to the shuttle. She asked me what I’ll do in KK and translated it to Zuldee after. She explained to me who they were and we just chatted some more. Zuldee and Ning were talking in Malay during the ride. In between, Ning was telling us how she broke up with him before, for being jealous and all, but he pursued her like crazy. She even believes that he had asked someone to do a kind of love magic coz she was not able to sleep well for two months and if she does, he would always be in his dream! Crazy, you may say but if she experienced it, then maybe it’s not that crazy afterall! Afterwards, she told me that he will be picked up by his driver and that he is offering to help me find a hostel along Jalan Gaya, the famed weekend market street (that I missed coz of the cancellation) and backpacker’s haven. It was an offer I cannot refuse since Zuldee seemed like a nice and decent man as we chatted in broken English while waiting for the lone Air Asia flight that will take us to Kota Kinabalu. I think I’ve fallen asleep after our conversation has taken its turn but woke up just in time for the sunset, a few moments before we landed. I haven’t seen an airplane sunset in a while, given that my last field work flight was in July and I haven’t had window seats in the previous ones either. The sunset was a bit of an orange hue, probably clouded or fogged since the captain announced that we may expect rain upon landing. 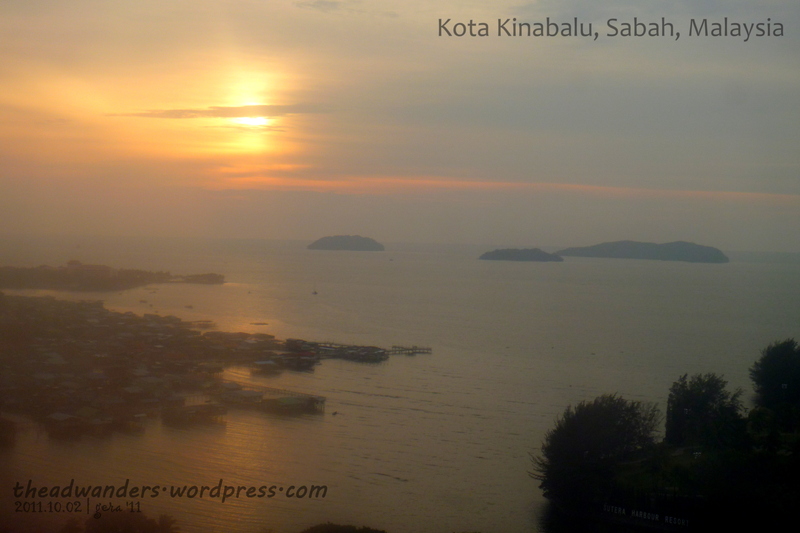 Nonetheless, it was great as I see it setting over the Tunku Abdu Rahman Marine Park (as my seatmate pointed out). At the airport, the phrase “Selamat Datang” is everywhere, welcoming residents and tourists alike. Zuldee’s process was faster since he holds a Malaysian passport and fewer people are on that lane. He patiently waited for me and even took my picture after I got out from the “stamping area”. 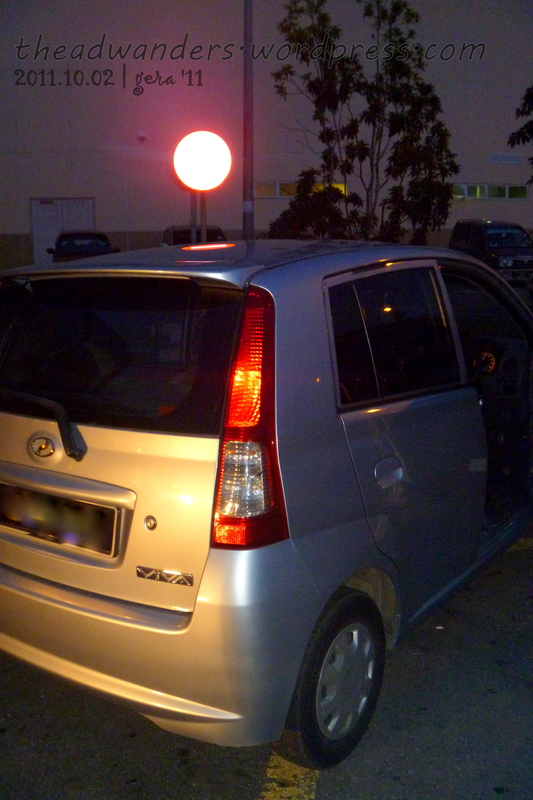 His driver and car, a small and very popular Malaysia-made silver automobile, waits in one of the bays and we made way for it. Popular for fuel efficiency and ease in parking! I wanted to open the passenger door on the right but in my surprise, a man is already seated—behind the wheel. I didn’t know that Malaysia is a right-hand drive country and Zuldee who was probably motioning me for the backseat, laughed about my blunder. Not in a mocking but in an amusing way. Anyway, he opened the door of the left backseat, removed documents and newspapers and afterwards, told me to open the one on my side. And from there, Zuldee did as what she had said. We changed some dollars into ringgit before eating (by hand, Malaysian-style!) 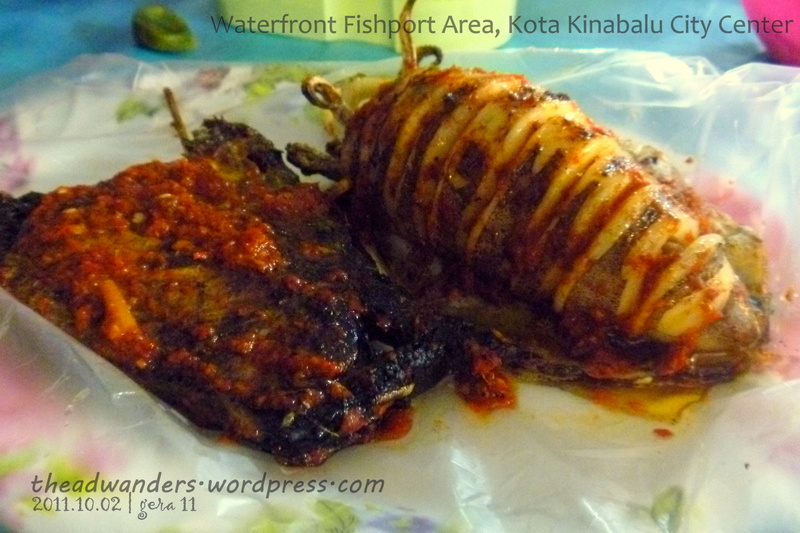 a simple but sumptuous seafood dinner by the food stalls that sprung at the fishing port area. Eating by hand, as is usual in Malaysia, we devoured grilled tuna and squid glazed with a spicy sauce and downed it with young coconut juice. From the port, we stopped by a small telecom shop, much like the ones we see at local malls here, to get my SIM card and top it up. I was told by Rajie, my Malaysian co-volunteer who worked at Maxis telecom, to get one so it will be easier for us to contact each other once I get to Kuala Lumpur where she lives. To test the SIM, I called her and we (more I than her) yelled in excitement as I have already started my trip. Zuldee, again smiling and chuckling, then motioned me to the car and helped me find Sensi Backpackers Hostel, my accommodation of choice, and hoped with me that there are still vacancies. I smiled at him, glanced at Zuldee and exclaimed, “Yes, I am.” He smiled back and then added that they have dorm beds for RM30 a night and told me to check the place if I wanted. Zuldee said to go on as the guy motioned me to the stairs leading to the rooms. I saw pairs of shoes and slippers at the bottom and removed mine before I even read the sign asking guests to. Rajie, in one of our volunteer training sessions, shared that it is a custom to remove one’s shoes and slippers before entering a Malaysian house. Hello hallway! I just love the dim light effect! On top of the stairs, to the left is the toilet, bath and wash area. The hot shower seemed inviting and it generally seemed quite clean. “T&B, check!” I muttered to myself. 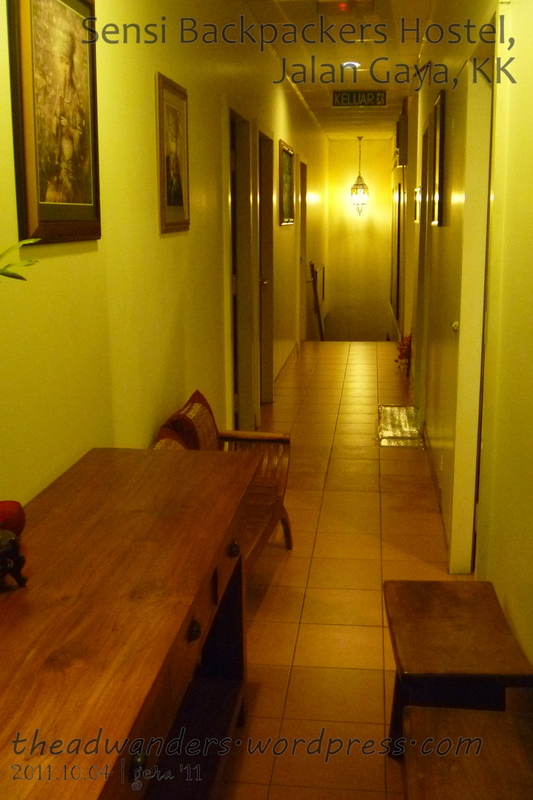 The overall aura of Sensi is quite cozy and relaxing, with dim yellow-orange lights in the narrow but not tight hallway. We passed by some double rooms and dorm rooms, including the kitchen/dining/TV area (where I muttered, “Free breakfast, check!”), until we got to the end of the hall, a few steps later. There, I met Sally, whom in a later conversation I would find out to be an English architecture student who came to KK for a three-month volunteering opportunity for a “green architecture” organization. Sensi is just her temporary accommodation before she moves to an apartment to be paid for by the org. She was busy answering emails on her computer as the guy asked which of the beds was vacant. She said she thought she’s the only one in there but a person lay fast asleep on the top bunk by the door. 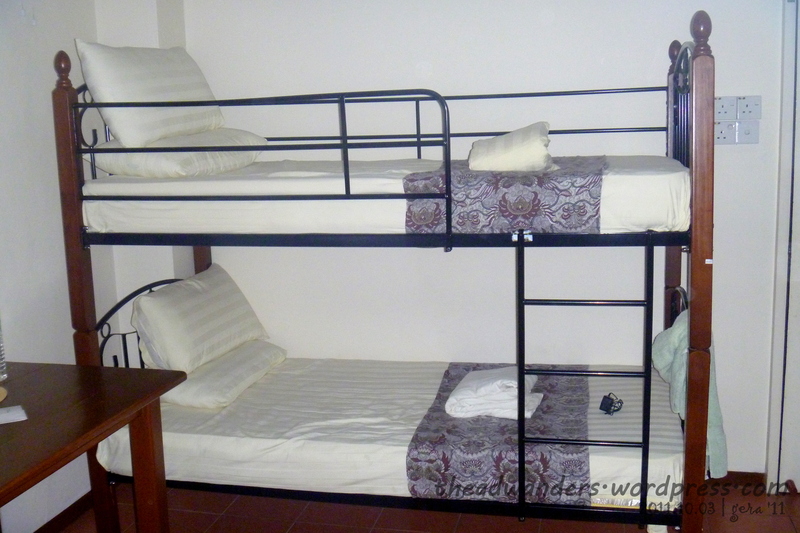 The dorm room consisted of three double-decked bed frames, furnished with comfortable beddings and mattress. A wooden cabinet stands between the two beds while two wooden tables and chairs are on opposite sides of the room. Over the window, I can still see activity in the restaurants and coffee shops that lined Gaya street. The air-conditioning unit was working properly and I feel at home. “Bed and room, check!”, I muttered to myself again. I told the guy I would take it and, Sally overhearing our conversation shouted with delight, “New roommate. Yey!” as if she just won a small town lottery. I smiled and told myself “Roommate, check!” as we descended to the lobby. Kuya Zuldee asked me if everything was alright and I said yes, I’ll take it. With that, he prepared to leave. But before he did, he told me that he’ll have a business meeting in the morning but he would be free in the afternoon. “You want, afternoon, jalan jalan?,” he asked, making his index finger go around in circles as he speaks. He had explained the concept of jalan jalan to me earlier while waiting in DMIA lounge so I understood that if I wanted, he will take me around Kota Kinabalu tomorrow afternoon. He knew I will go to the Tunku Abdul Rahman Marine Park in the morning so he said that he can pick me up upon my return from Jesselton Point, the ferry port to the islands and to Labuan, Malaysia where you can catch another ferry to Brunei.